The Great Smoky Mountains National Park is loved by millions of Americans, including the over 9 million annual visitors. Unfortunately, the vehicles that bring visitors to the park and aid staff also produce tailpipe emissions that pollute the air and threaten iconic views and species. 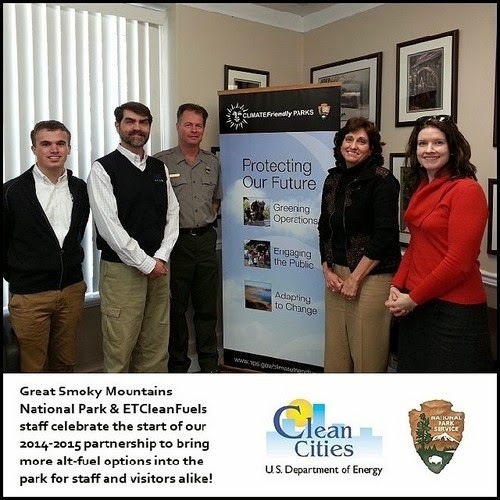 To reduce the environmental impact of vehicles in the park, the East Tennessee Clean Fuels Coalition (ETCleanFuels) is pleased to announce a new project with the National Park Service (NPS) and the Land of Sky Clean Vehicles Coalition to deploy alternative fuel vehicles, reduce park transportation costs and improve park air quality with joint Department of Energy and Department of Interior grant funding. The project partners will collaborate to replace three gasoline pickup trucks with all-electric work trucks, convert five gasoline mowers to operate on propane, and install four public electric vehicle (EV) chargers at the Sugarlands and Oconaluftee Visitor Centers. DC fast-charging stations capable of repowering an all-electric vehicle in about twenty minutes will be installed at each of the two Visitor Centers—a first for the National Park Service. Traditional Level 2, 220-volt chargers will be installed as well. A collection of outreach materials is also being released to help the Great Smoky Mountains National Park and others engage visitors and staff on the benefits of ecofriendly driving practices. The Green Rides Toolkit, as it is called, addresses vehicle idling, green driving habits, alternative fuels use, efficient vehicles options, and more sustainable forms of transportation such as mass transit, biking and walking. ETCleanFuels looks forward to assisting the park in its on-going work to reduce emissions. Since 2005, the Smokies have been using biodiesel in their vehicles and heating fuel and are one of the largest users of biodiesel in East Tennessee. By converting to alternative fuels, organizations not only improve the quality of their communities’ air, but also achieve fuel cost savings and help secure America’s energy independence. Local, county and state parks are encouraged to look to the National Park Service’s alternative fuels work as a tremendous case study example and are welcome to seek grant funding and technical assistance from ETCleanFuels as well.